With the bathroom product line Connect Air, the designers create a timeless elegance. The furniture and washbasins, which seems to hover, will still appeal to you in 20 years with their elegant design. Ideal Standard promises with this bath series "holiday from everyday life", which is implemented by narrow edges and gentle shapes. A perfect place of calmness and lightness that allows you this time-out at any time. The feeling of lightness is supported by multicolored bathroom furniture and a slim ceramic. A special highlight of the product line is the Aqua Blade WC without flushing rim, which ensures improved hygiene. The toilet AquaBlade® has a new flushing technology in which almost 100% of the toilet bowl is lapped with water and thus a clean toilet is remain. In conventional toilets with flushing rim, residues remain under the flushing rim and are difficult to remove. At the same time, the AquaBlade toilet also impresses with its attractive appearance. The two-tone bathroom furniture creates lightness and, due to their varied color combinations, can be individually adapted to floor elements, the ceiling or doors, for example. They can also be perfectly combined with the thin-walled built-in washbasins of the series, which give the furniture a hovering appearance. 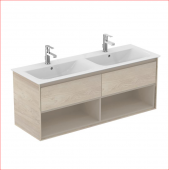 The products line offers vanity units for single and double washbasins, tall cabinets, semi-tall cabinets and individual consoles, each in different sizes. Depending on the type of furniture, the cabinets have one to four drawers, cabinet doors or open compartments and provide enough storage space for everyone. The washbasins impress with generous volume, which comes about through the exclusive design. In addition, the classic shapes are easy to clean. Besides the bowl shape, there are also washbasins in square shape or as double sinks. These can be either two vanities directly next to each other or a large one with two faucets. Also a mixture of angular and round is possible. 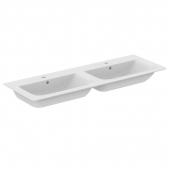 The product line Connect Air also includes washbasins, which are straight at the back and rounded at the front. Most wash basins have an integrated tap hole bank, but there are also basins without a tap hole bank, which can then be combined with a freestanding or wall-mounted faucet. The shower trays fit perfectly into the bathroom series and convince with simple elegance. The right shape is available for every situation and installation variant in the bathroom: square, quarter-circle or pentagonal. From a length of 90 cm up to 150 cm everything is possible. There are very shallow shower trays or deeper ones. Without a flushing rim, the toilet gets completely rinsed and remains hygienic. The look of the AquaBlade® toilet fits with its clean lines perfectly into the rest of the series. The toilets are available as a stand or wall version for an on-the-wall installation or in combination with a cistern. The cistern has a capacity of 6 liters and must be ordered separately. Bidets of the series are available as a floor standing or wall-mounted version without lid. They can be attached invisibly with the enclosed attachment set. The acrylic bathtubs, like the other products in the series, are characterized by narrow edges and gentle shapes. They are available in many sizes, so that even for two people the right model is with it. Choose between oval tub (1800 x 800 mm), hexagonal bath (1900 x 475 mm), body-molded bathtub (1700 x 750 mm), duo baths (1700 x 750 mm or 1800 x 800 mm) or even bathtub with shower area on the right or the left side. Ideal Standard recommends the faucet product line Tesi as a combination with the Connect Air bathroom series.